A balanced assortment of round and square pails that can be used as sand molds. 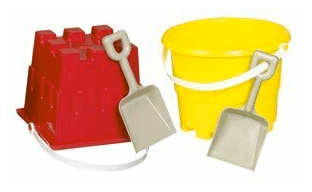 Shovels are attached to each pail with a removable handle strap. Assorted colors. Price per pail. Styles subject to availability.